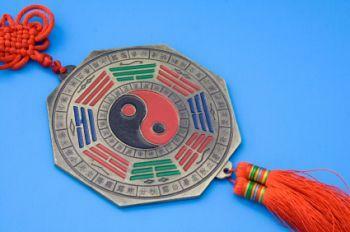 There are certain feng shui rules that apply regardless of which school of feng shui you follow. These crucial rules of feng shui are essential for creating aupscious chi energy in your house. Feng shui principles applied to architecture, home site, and interior design are practical and common sense directives not silly superstitions. Observe the following rules before building or planning a new home. Avoid a slope incline more than 45 degrees. Avoid power stations. They generate energy and can create energy chaos resulting in negative chi. If you have no choice, place feng shui bagua mirrors outside the home to reflect negative chi away from home. A house that overlooks or has a view of a cemetery is considered ill placed since a cemetery is a place of death. You can use bagua mirrors on the outside of the home to help diminish the negative chi, but you should avoid living near a cemetery. This kind of clutter can be overwhelming. Negative chi is difficult to counter. The layout of the street in relationship to your home can either carry positive or negative chi to you. Avoid a house on a street that forms a noose around the house. Intersections and dead-end roads that dump into your home all bring poison arrows and too much chi. Many Western feng shui practitioners feel a home situated below street level will bring oppressive and even financial ills to the dweller. This belief is not founded in authentic feng shui practice. House numbers need to be visible and neat. Winding streets in hillsides and mountains help slow down the chi. Driveways should end at your house and not run along side your home and away through the back yard or in another direction. This kind of layout will assure opportunities bypass you. You can help free up chi energy by applying basic feng shui principles. This is where chi energy enters your home so you want to make it inviting and easy for the energy to enter. Remove all obstacles such as shrubbery, objects, furniture, etc. Lighted entrance - Replace burned out light bulbs. Remove dead plants, trees, and shrubbery. Trim and neaten up yard. Keep sidewalks and entrance swept and clean. Repair or replace torn screens or blinds. Don't align the front door directly across from the back door or the chi will go right through the house and out the back door. Staircases can cause the chi to rush through the front door and upstairs depriving the first floor of positive chi. 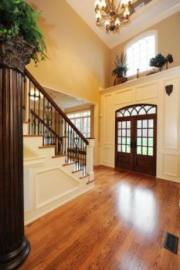 Don't place a staircase directly across from front door entrance. Don't make staircase cramped and narrow. Don't place a bedroom door that opens directly into a staircase. Don't use a spiral staircase; this causes energy to twist and rush upward and create negative chi. The kitchen is the heart fire of the home. Don't place the kitchen facing the front door. Place the kitchen in same direction (Kua) as main income-producer of home. Don't place the oven and range in northwest sector of kitchen. Keep oven, microwave, freezer, and refrigerator clean. Wash dishes. Don't let them pile up in sink or on countertops. Bathrooms are places of waste and debris removal. They are also sources of water which signifies wealth. Don't wash your money down the toilet. Close toilet lid before flushing and keep it closed when not in use. Keep bathroom door closed at all times. A red, black or dark blue mat around the base of toilet will assure wealth protection. Place a mirror on the inside of bathroom door to reflect any negative ch'i and containing it to the bathroom. These are the places where you want good relaxing chi energy flowing freely. Don't place bed directly across from door. Don't place bed in front of window. Don't sleep with feet facing door. Place pink sheet over king size box springs, which are actually two twin beds, to avoid marital problems. Suspend a faceted crystal ball from overhead ceiling fan to deflect negative chi. Energy enters and leaves your home through doors and windows. You want to be mindful of this energy flow whenever placing furniture. Make sure all windows and doors open and close easily. Feng Shui is a matter of common sense and good hygiene. Repair leaky faucets, sinks, etc. These create drains on your finances. Once you understand the basic feng shui rules, you can create a better energy flow in your home.